As some of the world’s top female tennis players head to the University of Bath for this week’s international Fed Cup event, the host venue is investing in the future with a pioneering project designed to encourage more young women to play the sport. Team Bath Tennis has this year expanded its successful Tennis 4 Girls programme, taking it into seven schools in the city and allowing more young women aged between 14 and 16 to re-engage with the sport, after being awarded a grant by Sport England. It is one of two projects in the city designed to buck the national trend of declining tennis participation, particularly amongst young women, with Saltford Tennis Club – supported by Team Bath Tennis – also successfully bidding for National Lottery funding to run a scheme providing more tennis opportunities to women and young people, as well as parent and toddler sessions and breakfast, lunch and after-school clubs. Tom Ellis, Head of Club Coaching at Team Bath, said the projects were important not only to get more people active but also in breaking down the “barriers and negative perceptions” that discourage teenage girls from engaging with sport. “Research shows that the gender gap between males and females participating regularly in sport and physical activity is widening between the ages of 14 and 16,” he explained. “There are a number of reasons for this – body changes can lead to young women feeling body conscious, they have changing commitments towards education or their friendship groups, many have low confidence in their own abilities and there is also a perceived lack of female sporting role models. “Without an intervention to address these issues, it is highly unlikely that young females will ever develop an interest or passion for playing sport and that is detrimental not only to their physical health but also their mental health. Team Bath’s Tennis 4 Girls programme, led by Hetty Alton, was launched in January 2018 to provide female-only playing and coaching sessions for secondary-school pupils at the University of Bath Sports Training Village. Originally running for one hour a week, it quickly proved a success and two additional sessions have been added. The additional funding from Sport England has allowed the programme to be taken directly to girls in their schools. Bath Community Academy, Hayesfield, King Edwards, Ralph Allen, St Laurence, St Marks and Wellsway will each receive ten hours of delivery over six-week periods, with around 30 students per session being engaged in activities such as mini tennis, touch tennis, cardio tennis and group challenges. Two fun days have also been staged at the University of Bath during the six-week period, open to all of the female students taking part and allowing them to meet people from other schools. The project is also helping to create a legacy by providing Tennis Leaders training for participants from each school. They learn the skills necessary to assist staff members in delivering tennis sessions at their schools once the outreach programme ends. 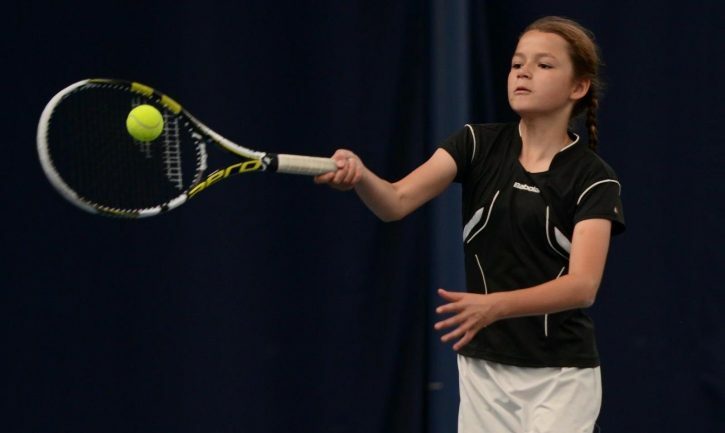 While nearly 900 people enjoy tennis at Team Bath each week, a 16% increase compared to 2017, the participation rates nationally are falling and not only amongst teenage girls – figures in the 2016 Sport England Active People Survey show that, across Britain, 30% fewer women are playing the sport compared to 2005-06. Reversing that trend is one of the driving forces behind the new Lottery-funded community programme at Saltford Tennis Club, based on the outskirts of Bath, which will target several groups who traditionally do not take part in activities. The club provides weekly 30-minute parent and toddler sessions, ladies mornings and delivers breakfast, lunchtime and after-school clubs on alternate weeks at Wellsway Secondary and Saltford Primary Schools. A senior licensed coach at the club also deliver a leaders course at Wellsway, allowing pupils to gain an extracurricular qualification as they develop their leadership, organisation and communication skills. Team Bath Tennis is an all-encompassing programme, providing coaching and playing opportunities for people of all ages and ability from recreational beginners to touring professionals. Visit www.teambath.com/tennis to find our more. Saltford Tennis Club is one of three outreach venues for Team Bath Tennis in the Bath area. For further details about Saltford Tennis Club, visit clubspark.lta.org.uk/SaltfordTennisClub.